The Helix Bridge, previously known as the Double Helix Bridge, is a pedestrian bridge linking Marina Centre with Marina South in the Marina Bay area in Singapore. The Helix Bridge is set to become Singapore's next landmark. Located beside the Benjamin Sheares Bridge, alongside the vehicular Bayfront Bridge, it was officially opened on 24 April 2010 and is the world's first curved bridge. The views of the harbor and some of the city's great buildings are wonderful. A night visit is preferable to see the lights and the magnificent view. This image belongs to the travel and nature stock photo library. This stock photo of Marina Bay Sands Hotel and Helix Bridge at Sunrise is available for licensing for commercial and editorial uses including websites, blogs, books, magazines, brochures and advertising. Restrictions may apply for images which contain third party copyrighted material or sensitive subjects. Photos of artwork are for editorial use only. 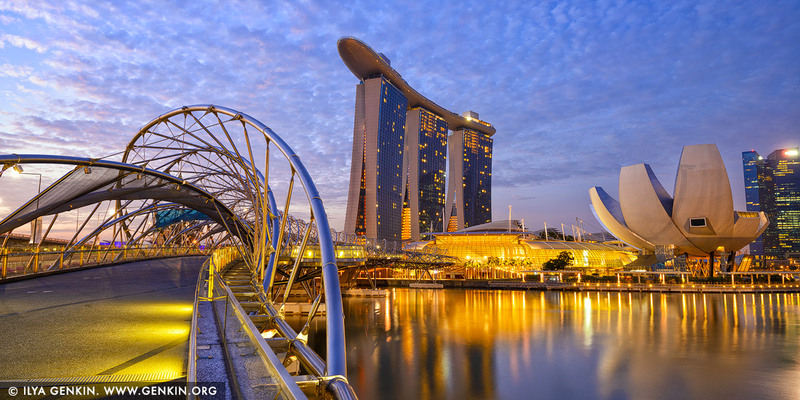 This image id SINGAPORE-0006 of Marina Bay Sands Hotel and Helix Bridge at Sunrise, is copyrighted © by Ilya Genkin. This is not a public domain image.